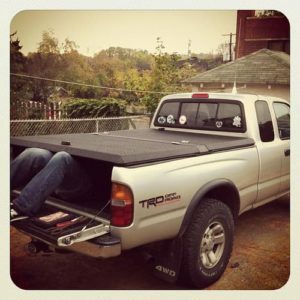 There has been a rise of theft of tailgates in certain areas of the United States. Texas has been hit the hardest out of all of the states, along with reports in Detroit, Michigan and Chicago, Illinois. On average, police are getting reports of 250-260 tailgates being stolen, just in 2012! Certain cities, in particular, that have been hit most have been Houston, San Antonio, and Dallas. These cities have had the highest amount of insurance claims between 2006 and 2012. However, people who are filing insurance claims seem to be the minority. Therefore, reporting the amount of insurance claims would not be accurate in displaying how frequent this were to happen. Average tailgates range from $1000 to $4000, then sold on the black market for a fraction of what they retail for. Authority figures and local police of Texas have found 26, possibly more, tailgates stolen off of people’s trucks in the past year alone. It really takes little to no time (Ten seconds or so for people who know what they are doing) to take them off a truck. Authorities cannot see a pattern in which people or automobiles would be targeted. There are a wide variety of types of people and vehicles. However, Ford F-150’s and F-250’s seem to be prime targets in areas where tailgate theft is a problem. Late model Chevy’s and Dodge’s have also been targeted as well. Researching the subject of tailgate theft online, there are even tutorials and “How-to’s” on how to steal a tailgate off of a truck, specifically with steps and pictures. Why, should you ask, are people stealing tailgates off of trucks? Police have caught a few suspects in the action of stealing, and questioned them of their intentions with the automobile part. To make some easy money. There are also car places that sell a mechanical deterrent from thieves. There is such a product called the “Gate Keeper” that makes sure your tailgate is extra-bolted onto the truck and is very very hard, even impossible to get off of the truck. It’s like a dead-bolt for your door, only for your tailgate on your truck! Very handy! If you are in Texas, or in areas that have been mentioned, it would be a good idea to look into this gadget! So if you have a truck, lock up your tailgate and get a Gate Keeper very soon!